NOTE: I first met John Melngailis at Bread Furst, James Beard winner Mark Furstenburg’s Washington DC bakery. Mark had been kind enough to arrange for me to appear at the bakery to publicize The Rye Baker, and invited John, whose love of his native Latvian rye breads prompted him to found Black Rooster Food and start baking them commercially. Needless to say, John and I hit it off immediately, spending a good part of the morning talking about the marvels of Baltic rye. He was also kind enough to bring me a loaf of each of his breads — dense, sweet-sour rupjmaize, and a triangular loaf of his fruit-and-nut holiday bread, both of which were extraordinary. So when John sent me this essay on his relationship with the bread he loves, I simply had to share; it’s a fascinating read. I am Emeritus Professor of Electrical and Computer Engineering at the University of Maryland. I could be consulting, teaching, or continuing research on nanotechnology—work that I have enjoyed for many years. Instead I am marketing Baltic rye bread. Why? Because I believe, and I am not alone, that the critical issue facing us today is the health of our population. Persuading people to eat the super-healthy, 100% whole-grain rye sourdough bread of my homeland and of my family is my small, personal contribution to improving health. More sophisticated electronics, to which I have contributed in the past, will not do it. In fact you could argue that it has contributed to our health problems. Why specifically this bread? The first reason is my personal connection to it, and the second is its scientifically proven health benefits and its affordability. My family came to the U.S. in December 1949 from a DP (displaced persons) camp in Germany. Just as Syrian refugees today are fleeing death and destruction, we left Latvia in October 1944 just ahead of the Russian army. We were fortunate to end up in the U.S., in our case, in a remote corner of Western Pennsylvania. I was warmly welcomed as a 10-year-old fourth-grader in the local one-room schoolhouse. My parents were happy to have a roof over our heads, plenty of food available, work, good prospects for their children’s future. But the bread. We lived out in the countryside and the only bread we could get from the local stores was Wonder Bread or its equivalent. To us it did not feel like bread, it did not smell like bread, it did not taste like bread, and we noticed that a hungry stray dog would not eat it. As a businesswoman in Latvia, my mother had never baked bread, yet she was determined to bake dense, hundred percent whole-grain Latvian rye bread, or “rupjmaize” as we know it. It was, and is, the antithesis of Wonder Bread: no nutrients removed by refining, no false, chemically-derived, nutrients or preservatives added. Yet it naturally has a long shelf life. But where to get whole-grain rye flour? It was not to be found in any near-by stores. My mother got a bushel of rye grain from one of the local farmers, who was growing it for some purpose other than bread baking. But how can we mill the grain into flour? The father of one of my classmates had a mill on his farm for grinding corn for pig feed. He was willing to use it to mill our rye grain. I remember him first running some wheat through the mill to clean out the pig feed and then running our rye grain through the mill twice. My mother was born in 1896 and lived on her family farm to about age 19. With the help of an old Latvian cookbook and some childhood memories she began baking and soon developed an excellent “rupjmaize.” She baked almost to the end of her life at the age of 91. So we set up a small business and for a couple of years sold “rupjmaize,” flown in from Latvia, at Whole Foods in the Washington, DC, area. When the value of the dollar shrank from $1.28 per euro to $1.68 per euro we had to stop. We found a bakery in Brooklyn, New York Bread, that was able to duplicate the recipe. We reorganized the company, and brought in my brother Ivars, who now sells our Black Rooster “rupjmaize” on the web. We have been selling the bread largely in the New York area for seven years. I’m not earning any money for myself doing this, so why do it? We are facing a health crisis in the U.S.: obesity, diabetes, heart disease, etc. An important factor contributing to the poor health of our population is the excessive consumption of industrial, over-processed food thanks to the drive for corporate profits aided by misguided government subsidies. I’m convinced that introducing our rye bread to the American diet would be helpful. It is delicious paired with traditional rich foods like smoked salmon, grilled sausage, herring, bacon and eggs, schmaltz, butter, cheese and so on. It also pairs well with healthy vegetarian foods like nut butters, avocado, radishes, hummus, cucumbers, or raw honey. To any rich food it provides the counterbalance – the fiber and body, which allows the rich food to be properly digested. So far we have had some success in gourmet stores and with consumers with northern or eastern European roots. Ideally I would like to introduce the bread to the general American public. My quest may seem quixotic. I often like to say: Everything is backwards. This is the richest country, yet it has the world’s worst diet. The rich are skinny, the poor are obese. The good food is in the big cities, the unhealthy food is in the countryside where food is grown. And now I am marketing the most humble Latvian peasant bread in gourmet stores. In Latvia, “rupjmaize” is a staple food, particularly for the less well-to-do. (Everything there is not backwards.) Hearty whole-grain bread with a long shelf life has sustained northern Europeans for centuries; even today you see very few who are obese or even overweight. Diet may be a key factor. I want the U.S., my adopted country to which I owe so much, to benefit from my experience. Let me first make some nonscientific claims. Based on what I know from my own body and from what friends and family have said, whole-grain rye bread is satiating. It makes you feel full in a wholesome way. My own taste buds tell me that our rye bread is the ideal accompaniment rich foods. I would find eating a teaspoon of pure butter by itself revolting. Yet spread on a slice of rye bread it is delicious. The same can be said for other rich foods. A fair amount of research has been done in the area of rye bread and nutrition. I have found and looked at much of the peer-reviewed literature on the subject using, for example, the Web of Science, which I often used in my own research. Then I stumbled on the website Rye and Health, which makes all the arguments I would want to make and more, and in greater detail. It includes extensive references to much of the same literature I found. One can legitimately be skeptical of material “published” on the web. However, in this website claims are substantiated by published, peer reviewed research, and the list of universities and companies that created the website are disclosed. One could point out that the baking companies who sponsored this website may have a vested interest in the conclusions (so do I). Still the companies make money regardless of what grain is used. Universities and research institutes are expected to be objective. Moreover, all participants have an interest in maintaining their reputation for integrity. The Rye and Health website discusses several areas where rye is expected to have a positive impact on health including glucose and insulin metabolism, weight management, cholesterol reduction, and colorectal cancer prevention. The benefits are supported by conclusions of research papers published in peer reviewed journals. Gluten content of food has become a concern for many Americans. Some healthcare practitioners continue to group wheat, oats, barley and rye together under the heading of “gluten grains” and to ask for elimination of the entire group on a gluten-free diet. Other practitioners now treat wheat separately from these other grains, including rye, based on recent research. Wheat is unquestionably a more common source of food reactions than any of the other “gluten grains,” including rye. Stanley Ginsberg in his book, The Rye Baker, discusses in technical detail the chemistry in the rye dough and in rye bread. The action of gluten in rye is quite different from what it is in wheat. Wheat bread depends on gluten to give it a porous structure, but the gluten hardens rather quickly causing the bread to become stale. Rye bread, on the other hand, does not depend on gluten to give it structure but rather on a starchy gel which remains tender long after baking and explains why rye bread stay fresh for weeks. In addition the rye kernel contains a lactic acid producing bacteria as well as wild yeast, which turn simple sugars into lactic acid just as in yogurt, buttermilk and sour cream. It is this combination of factors that results in the long shelf life of rye bread and the absence of mold. A long New York Times article (“Rye Rises Again” Food Section, January 11, 2017) also states that the gluten content of rye is lower than that of wheat. A couple of friends and relatives who are gluten intolerant are nevertheless able to comfortably eat the rye bread. In the past, diet was largely determined by availability, taste, and tradition. Nowadays a bewildering array of foods is available, tradition is diffuse and taste is manipulated chemically, and by advertising. Food claims based on scientific studies abound leading the various fads. So it is with some skepticism that I have nevertheless cited scientific studies showing the benefits of rye bread. For my part I pay attention to my taste buds and how the food makes me feel. Over the past nine years I have spent thousands of hours demoing rye bread in stores. Somehow doing two 4 hour back-to-back demos in one day on my feet has been less tiring than uplifting. My dream is that someday more people will buy our rye bread with food stamps than with American Express gold cards. We are far from realizing the dream. At the moment Black Rooster Food is selling Baltic rye bread in 38 stores, 3 restaurants in NYC, and one prestigious catering company in DC. Of the stores 26 are in the NYC area and 6 in Boston area, and 6 in Washington, DC, area. Over the years, the United States has absorbed food traditions from all parts of the world. It takes time and it starts with the more affluent, well-traveled, and adventurous eaters. In 1966 when I returned from a year in Paris, hardly anyone knew what a baguette was. Now they are everywhere. Similarly, 50 years ago sushi in the U.S. was almost nonexistent. Rye bread may be starting on a similar path. Recently some articles have appeared about rye’s renaissance, notably the Sept. 15, 2013 New York Magazine article “Rye’s rise,” which also was reprinted on grubstreet.com; The New York Times, (“Rye Rises Again” Food Section, January 11, 2017); and Seriouseats.com, which devoted an entire article to Black Rooster. Given the density of our rye bread, it works best for open face sandwiches. Open face sandwiches are beginning to appear with increasing frequency in the food scene in New York and beyond: Dean & DeLuca, and The Great Northern Food Hall in Grand Central Terminal are serving open face sandwiches. The rapidly growing chain Le Pain Quotidien serves only open face sandwiches. Perhaps people are beginning to appreciate the arguments I have made above for more natural, less processed food. The simple honest taste based on freshness in Nordic cuisine is attractive and Nordic restaurants and eateries seem to be opening more and more in New York City. I can see the beginning of a trend. What do we need to do so that Black Rooster Food can contribute to, and take advantage of, rye bread rising? We need an investment for advertising and publicity, and we need a person or persons to take a leading role in the running of the company. Ideally the investment would come from someone with a partly altruistic motivation. It should also be possible to find the right people who share the vision I have outlined. There is a clear movement away from over-processed industrial foods toward more natural products. However, in many cases this move is inhibited by the expense of healthier foods. Thus the less affluent have a diet, based on industrial, heavily advertised, poor quality food. This is where our bread could find its place. In Northern Europe it continues to be a staple food, not only for the gourmets, but particularly for the less affluent. Why not here? Rye bread can be quite inexpensive, it’s nutritious, delicious, healthy, and has a long shelf life. If whole grain rye sourdough bread became a staple food in our diet, the health of our population would improve. I welcome your thoughts and suggestions. Feel free to email me or phone me at (301) 512-3813. The amount of rise in the rupjmaize photo is impressive given its 100% rye. I would love to see the recipe! Hello Mr. Ginsberg, I have been using your excellent book to make rye breads at home with some success. Having read Mr. Melngailis’s article about the bread of his mother country, I decided to bake something similar to what I saw on the picture. First, I went to a local Russian store, this is Budapest, Hungary and bought a Latvian bread, something similar to what I think in the Little Black Rooster store is made. Since there is no recipe for that bread, I looked up your book and and your homepage, and I found a recipe of the “Latgalian-Rye” which may work for my purpose. I have made the bread according the recipe and compared it to that I had bough in the Russian store. When I compare, firts I look the exrerior, well the Latvian bread had that nice blackish color, not burnt , tender easy to cut in. My one was not so black, rather braun and not so tender. As to the smell and aroma, the Latvian had that characteristic “kvas” smell, interestingly here in Hungary we call the sour culture “kovas”, probably because the Hungarians migrated to Europe from middle Russia in the 10th century and they brough the word “kvas” with them. However, the “kvas” smell and aroma, I coul not get from my bread. Thirdly, the interior, well rhis was at least similar, dense but tender, and the anise aroma from the scald got through. I was happy for this! Of course, I am not halted by the differencies and will continue improving the quality of my bread, the question is how to proceed? This is really the reason I am writing to you. Would you have some advice to reach that tender blackish exterior, and that “kvas” taste? In my opinion you could use orginal red rye malt (fermented malt) to make scald. It gives rich dark brown color and kvas smell. Roasted mald it’s not the same. Look for special malt for bread not for beer. Thanks for your advice! I think you hit the nail on the head! I am using two kinds of rye malt, one is red the other is grey, like rye berries. Scalding is not easy especially maintaining the temp, it is not enough to set the oven meter to 65 deg, the matarial is not at that temp, in addition I loose a lot of water during scalding, and I am not sure that I should add that amount back? The two malts are from a local beer company, that is what available. The kvas flavour and aroma come after fermenting the scald and the sour culture, the opara, however once when I overfermented the mixture, a strong alcohol smell overcome the nice kvas aroma, so I guess I have to experiment xith the opara fermentation. I you have any info on this I would love to hear about that!!! I did “Latgalian-Rye” this way: 1step scald+rye sourdough 6-7 h at 28-32oC and opara-2step fermentation with yeast 12 h at 28-30oC. The first step in detail: add the whole sourdough to scald temperature of 50-55°C, DO NOT MIX!! !, leave to stand for 3 hours. After this time stir and leave to acidify for 3-4 hours. Scald must cool down before mixing to 28-32oC, higher temperature may kill bacteria and wild yeast. Great! I will try that! But, why not cooling down the scald to 30 degs, and then add the sourdough well mixed? Or is there any reason to put the sourdough in the 50 degs scald in an unmixed state? Usually, I cool down the scald to about 35 degs with adding cold water to it, exactly the amount I loose during scalding. I keep checking on scald temps during the procedure, so some 20% of the water evaporates. At the end I simple add that water back to the scald and mix in the sourdough and let it ferment for 9 hours at 30 degs. What do you think? It may be too long.. Yesterday, I bought again a Latvian bread in the Russian store, the kvas smell and the tender crust, oh yes, not to mention the black color it is amazing, so intense! I do not think I can do that, but will keep trying. I guess during opara fermentation, I have to check on the kvas aroma more often and stop fermenting at the peek of the intensity. But I am not sure. Any comment is appreciated! By the way, at what temperatures do you bake the bread? I maintain 260 for 10 min and 190 degs for 45 min, this is for one loaf of 850 gramms. The crust comes out deep brown, it shines due to brushing it with hot starch but it is not black, I wonder why? I baked at ca 230-240oC 70 minuts, at the end cooling down to 200oC. Im homebaker, baked this bread only once. Ok, thanks for your comments! I’ve not been able to get THAT much rise from this recipe. Is there a trick? My bread comes out rather wide and flat. Not like the picture in this recipe. Try reducing the hydration by 5% or so; that should stiffen the dough somewhat and reduce spread. Understand, however, that lower hydration will also produce a tighter crumb, which actually is typical of Baltic breads. Paldies! Would love to see this bread in stores on the West Coast, specifically Portland, Oregon or Seattle Washington. I love the Lāči real rye bread. We have a friend that lives in Latvia and brings us several loaves whenever she or one of her family members visit. I have tried making sourdough rye bread at home but it’s just not the same. I don’t quite have the skills Stanley has! I would love to be able to purchase it in the US on a regular basis, especially if it’s not at the gourmet prices! Do you have a web site you are selling your bread from? That seems a wonder bread, it must taste as good as it looks! I would love to make it, too! Here, in Budapest, Hungary there is not such bread in stores, but I remember eating tasty rye breads while studying at MIT in Cambridge, this picture brings back great memories. So, let us see the recipe and the technology!! I first tasted Black Rooster when I purchased a loaf at Russ & Daughters in NYC. I then brought it in as a product to my co-op food store in Western Mass. John would tirelessly come and sample his bread…I can tell you…it is absolutely DIVINE!! I have since moved, and mourned the loss of access to Black Rooster bread. Until…I picked up Stanley’s book and perfected the Ammerland recipe. It’s not the same…but nevertheless I love it. If you ever have the opportunity to try Black Rooster Rye you are in for a treat! Oooooooh that Fruit and Nut, toasted and slathered with fresh creamy farmstead butter!!!! I am so happy to read this post!!! Born and raised in Lithuania, I always find myself sniffing the loaf before slicing it… 🙂 while living in Ireland, that’s the one and only food I miss the most.. Thanks for sharing. Born and raised in Poland, dad’s family coming from Lithuania and Belarus, mom’s from Germany, rye bread is a must. Plastic wrapped “wonder” bread for us is a horror bread. Real rye bread fills you up for hours without making you fat and hungry for some more junk. That’s what bread is for. Delicious! I picked up a quarter-loaf at Zabar’s yesterday while visiting my folks. Much better than the rye breads at my nearby Russian stores in NE Philly. I’ll buy this whenever I come back in to NYC. Very interesting Article about rye breads. General it seems is the old generation, kind of bread. I grow up with all kinds of rye bread in North Germany, Hamburg . Even in the southern Part of German is rye not very popular, more spelt and wheat. Rye is the cold weather grain and based on different diet more or less popular. Rye needs again bakers willing to bake good bread, good marketing and always good sourdough bread and not the rye with overpowering caraway flavor. The consumer on the other hand need information, education and willing to pay for healthy bread and NOT the wonder bread price, a loaf for 99 cent. No wonder about gluten intolerance and overweight problems here in the USA and in other countries eating mostly white bread . I bake every week 2 kg Bread , my whole grain, full of flavor homemade sourdough bread for open face sandwiches . My husbands favorite lunch .My neighbor was not so “amused” from my bread gift, because his complain was, he has to chew!!!! !Yes we got teeth for a reason !. Oh well. I couldn’t agree more with the conclusions of the article. The reason John’s mother started baking bread was exactly why I started baking my own – an acute (soon to turn chronic) case of Wonderbread intolerance. Fortunately, since moving to Maine 16 years ago, several bakeries (including my own micro-bakery) have sprung up, and people’s interest in producing and eating “real bread” is growing. Two loaves arrived in the mail today. 4_days to arrive in Alaska. The fruit bread is addictive. The dark baltic loaf less so but darn good. Not cheap, but will be ordering again as there is nothing like these breads available any where around here. Loved this article. My parents were DPs. I was born and raised in California, and rye bread was very anemic. 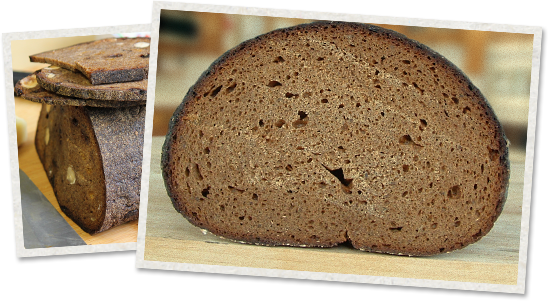 I now can buy black bread imported from Lithuania, but I wish for the displays of rye bread in any grocery store in Lithuania – a wall full of various types! And if you ever make it to a farmers market, you will be blown away by the breads sold there. My previous attempts at baking were nit successful (and I even made my own starter with rye flour and water brought back from Lithuania), but you’ve inspired me to try again. wishing Black Rooster continued and greater success!